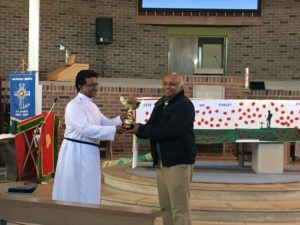 2018 Family Quiz Competition winner, Mr. Thomas Abraham receiving the trophy from Vicar Rev. Jacob Mathew. Congratulations to both Thomas Abraham (Sajiv) and Reena Abraham.